← Bits: Matilda’s Play Edition. Do you see that HUGE, RED boo-boo on her forehead? Alice totally fell on concrete and broke her fall with her head. Twice Alice tried to walk on our poorly designed front walk, which has a HUGE RANDOM step in the middle of it — and I stopped her. But the third time was the charm and I saw her right as she took that step into air and fell on her face. And I gasped and ran over there like a total maniac/mom. 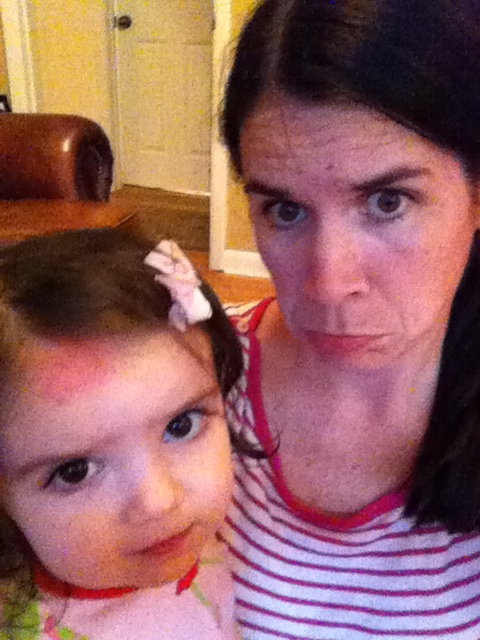 She’d landed right on her forehead. I thought it was all scraped, but it wasn’t. She just hit it so hard it made all these little blood dots pop up under the skin. I ran and got Kevin who told me that she would be fine, that it was just a bump. She calmed down right away and began acting her normal self. For any hint of craziness or passed-out-ed-ness or pain. And then I started taking the picture you see on this blog and she started getting all upset. So then I began to feel like maybe she was in pain because she loves having her picture taken. But then later when we were doing our nightly “Look how cute you are!” act in the mirror, she got upset again. She’s mad about that ugly bump! In the meantime, I’ll be checking on her non-stop while she sleeps. And we’ll avoid mirrors for awhile.